“Thank you” seems so insignificant to say to someone who believed in you when you didn’t believe in yourself. It doesn’t convey the same sentiment as “You made me, and every one of my sisters who knew you, a better person.” It’s not quite the same as “You were our steady foundation in times of uncertainty.” But I guess there are no words that could truly capture what Janet Ridgway meant to me and the rest of the Psi Mu Chapter of Chi Omega at University of Central Florida. For over 10 years, Janet served the chapter through various roles, from personnel advisor to financial advisor. If you asked any Psi Mu member during that time what Janet’s role was, she would say that Janet was a mentor, a shoulder to cry on, an ear to listen, a friend, a counselor, the heart of the chapter, the living example of Chi Omega’s symphony. Thank you, Janet, for always being what we needed most. Advisors like Janet are the reason the Greek experience is still great a one. Personally, I know I would not be where I am without her influence. Take time this month to thank the amazing advisors who have affected your life in ways you can’t even describe. We didn’t have Advisor Appreciation Month when I was a collegian, and I don’t think that it is ever too late to say “thank you” to those who mentored us along the way. I was part of a small recolonization effort for my chapter at Kent State University years ago. I clearly remember the struggles we had when we were without local chapter advisors. For awhile we were so blessed to have a wonderful graduate student, Sanni Tenkku, from our Gamma Alpha Chapter at Baldwin Wallace College as it was called at the time, serving as our chapter advisor. Sanni was a tall, beautiful, willowy young woman, and we just wanted to emulate her in every way possible. She provided so much guidance to us as we worked hard to rebuild the Delta Zeta chapter. Among those early supporters was our house corporation president, Susan Little, from our Alpha Chapter at Miami University. We were in the little yellow house that slept seven in those days, and it seemed she was there to greet us when we moved in and there to see us off when we went home for the summer. She still serves in that same capacity for my chapter today -- but the chapter is 10 times larger and enjoys a much larger home for 30 women. Sue still takes care of that house like it is her own -- we owe her so much! And she continues to provide guidance and direction for the many collegians’ lives she touches daily. And then there was Norma Andrisek, another Gamma Alpha, who was serving as the national vice president at the time. She assisted our chapter with our recolonization efforts and guided us through recruitment for many years. She was a very early mentor to me and is still there for me today. I was privileged to serve on her council when she was national president. We have been blessed to travel together to council meetings and conventions for many years. We will head off together again this summer for convention in Tucson, Ariz. I have been truly blessed with wonderful Delta Zeta advisors and mentors in my life who have become some of my dearest friends. Although all of our experiences and the paths we travel are unique, there are key individuals and advisors in our lives along the way we will always remember with great fondness for the roles they played in our lives. I give special heartfelt thanks to Sanni, Sue and Norma. During Advisor Appreciation Month, I would like to honor and say thank you to the many women who selflessly and tirelessly give of their time to support our collegiate chapters. One such woman is a friend and sister I work with daily. Carole Cordray-Syracuse juggles a demanding volunteer and professional schedule. 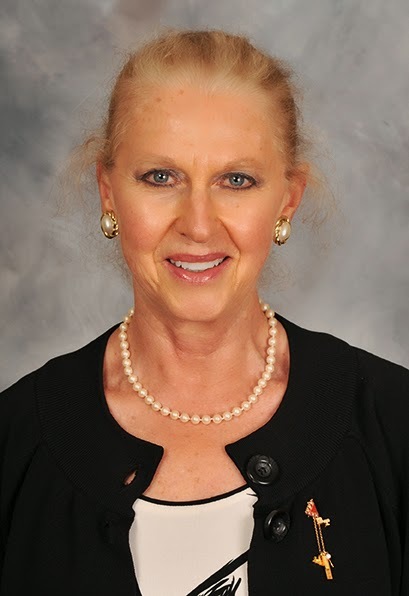 Carole serves on the Sigma Kappa NPC delegation as an alternate delegate, as an NPC area advisor and as a collegiate chapter alumnae advisor at Ohio University. What makes Carole's story unique is the fact that she is an alumnae initiate of Sigma Kappa. As an undergraduate at Kent State, Carole’s studies precluded her from joining a sorority. Career and family took her to Athens, Ohio, Ohio University and Sigma Kappa. From the day she was initiated, she has continuously given her time, talents and gifts to Sigma Kappa collegians at Ohio University. She has provided guidance, education, support and a good listening ear to countless young women over the years who remain in close contact with Carole today. Carole represents a legion of women: our local chapter advisors who are often the unsung heroes of our organizations. They touch the lives of many, give countless hours of service, and deserve our deepest appreciation for the work they do daily. Thank you to Carole, and thank you to the countless women serving our organizations as chapter advisors. Please take the time today to say “thank you” to the women who support our collegiate chapters as alumnae advisors. Advisor Appreciation Month is a time to reflect on those who go above and beyond to play a positive role in the lives of others, simply because they care. I have been fortunate to have these people surrounding me since I went through primary recruitment in January of my freshman year. As a freshman, I could never have anticipated the impact that belonging to a sorority would have on so many aspects of my life. It has given me the confidence to be a leader, the patience and understanding to belong to a sisterhood of very different personalities and the drive to pursue all of my goals head-on. A lot of this confidence grew out of my position on Pi Phi’s executive council as the vice president of administration (VPA). In my chapter, the VPA is considered the “rules person.” Not exactly the most fun-loving position for someone who typically approaches situations with humor. The position required me to adjust and stand out as a leader much more than I ever had in the past. During that time, I had several alumnae advisors who were there for me without fail -- there to answer email, stop by the chapter house on a minute’s notice, take midnight phone calls and be there as constant confidants. Two advisors, Kristi Geiger and Gretchen Foran, became my friends. What makes advisors so special is that they are volunteers. They choose to use their own time to help further your goals and ideals, because they want to see you succeed. During some of the tougher moments of my term as VPA, I recall receiving hand-written and email notes from my alumna counterpart, just dropping in to say I was doing a great job. These moments of reassurance and kindness helped build my confidence as a leader while showing me the support that I had not only as a sorority member but also as a person.